Join Yao Ming on his mission to Africa to investigate the ivory poaching crisis. Last year, 33,000 African elephants were murdered, victims of senseless ivory poaching. Fortunately, these magnificent giants have a defender in basketball superstar and wildlife advocate, Yao Ming. On Tuesday, Nov. 18, at 10 PM / 9 PM C, Yao travels to Africa to witness first-hand the horrible consequences of poaching in SAVING AFRICA’S GIANTS WITH YAO MING. The one-hour special, narrated by actor Edward Norton, follows Yao, who is a cultural icon in both his native China and in the United States. Yao’s on a journey where he quickly realizes the real war is not in Africa but in the marketplace. Yao travels to Kenya, home to the ancient Samburu people and a natural habitat of African elephants. Elephants are part of the Samburu heritage and are critical to their livelihood. Poaching not only destroys the wild species but also the tribal villagers who depend on them. Yao meets with Iain Douglas-Hamilton, renowned elephant expert who echoes WildAid’s dire conservation message, which he urges Yao to bring home and disseminate globally: it’s a race against time for these elephants; when the buying stops, the killing can too. Every year, the death toll rises, and 4.5 million elephants have been killed in the last 60 years as part of one of the most organized, widespread wildlife trafficking networks in history. Yao hopes his influence in his homeland and his combination of strength, vision and voice serves as a megaphone to help spread awareness about the cruelty of poaching. “Yao represents the next generation of conservationists. Having him as an ambassador is probably the best thing that could happen to wildlife,” said Peter Knights, executive director of WildAid, the world’s only organization focused on reducing the demand for poached products. On his journey, Yao sees for himself the evidence of a losing battle, where Africa’s giants are senselessly slain every day for their tusks. Unfortunately, elephants are not the only victims to poaching. Rhinos are also poached for their horns at a record rate – two rhinos a day are slain in South Africa alone. 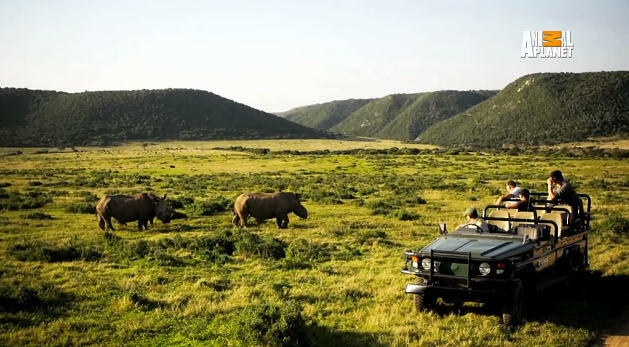 Yao travels to the Kariega Game Reserve, located at South Africa’s East Cape, to experience the struggle and pain of orphaned rhinos, whose parents have been killed. “When our message is spread by those who see this documentary, people can join us and hopefully wipe out this black market,” Yao said.